Spam is retro, isn’t it? I was certainly surprised to see it listed on the breakfast menu at The Thirsty Scholar in Manchester! The Thirsty Scholar is located under a bridge and looks a bit daunting to a mild-mannered lady like me. But it is worth venturing in, because the bar staff and Mod, the chef, are all really friendly and helpful, and the portions are gigantic. It’s not refined, elegant food: it’s big and greasy and hits the spot. So while it wasn’t the best breakfast I’ve ever had, it was exactly what I expected, and I will have it again one day when the mood takes me. It consisted of three toast triangles (one of the best serving sizes we’ve encountered), some mushrooms, roasted tomatoes (boo! ), lots of beans, sausages, and spam. The spam was a bit unnecessary, I thought – it was an extra bit of meat that didn’t really contribute much to the dish. In fairness, I may just have been underwhelmed because I never tried real spam, so didn’t have much to compare it to. The menu listed a solitary hash brown amongst the components, so imagine my delight on finding two hiding there under the toast! They were delicious, as was the black pudding, which costs extra but is hard to resist when it’s available. We went there on a gorgeous summer day and dined at the picnic tables outside. The main drawback to Thirsty Scholar is that they don’t start serving breakfast till 1pm on Saturdays. That’s just lunch, is it not? I suspect it’s very much intended as hangover food: the late start, the greasiness. I imagine it would be very good for that. For me it will be a rare indulgence. This entry was posted in Travel, Vegan Mofo and tagged Thirsty Scholar food, vegan full English, vegan Manchester, vegan mofo. Bookmark the permalink. 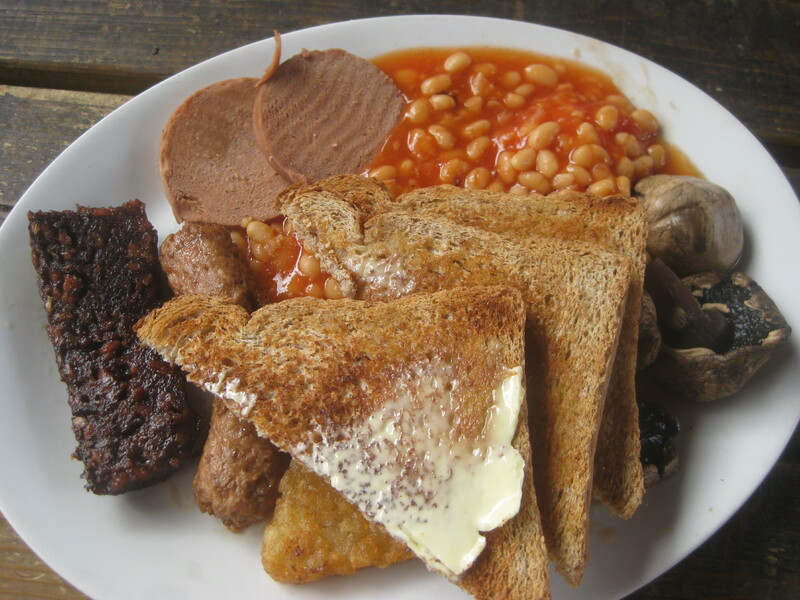 I loved eating Mod’s food when I was in Manchester & this looks like a pretty epic breakfast. I remember being astonished by the portion of chips and onion rings the first time I had a burger there. If you’re hungry, it’s the place to go! Vegan spam?! I didn’t even know such a thing existed! Being old enough to remember the real thing, I’m hoping they don’t taste alike. Looks like a decent fry up though, I always like a potato element in the brekkie. Yeah, I always had the impression that spam wasn’t really a meat you would choose for its taste. To be honest, the vegan version didn’t have too much flavour, it was more of a generic imitation meat…probably a good thing! WOW! What a plate! I didn’t know that vegan spam existed either! LOL Great post! Yeah, you really don’t need another meal all day after this! Aw, dear Mr Mod. Pleased to see him getting a shout out. I’m pretty sure that the spam Mod uses is Fry’s Polony, the big sausage one that you buy frozen. It’s ages since I’ve had a breakfast there, i used to live up the road and am very find of the Scholar. I don’t think black pudding used to be on it. I love that black pudding and we often have it in breakfasts at home. Black pudding is the best! It costs an extra £1, which I suppose is steep compared to the shop price, but who can say no to black pudding? I’ve never even heard of black pudding! I sure wish I could go out somewhere for a full english breakfast. When I tried cooking one for myself for mofo, I was so annoyed at how many dishes it took and how much work it was to make each component. I would probably even be happy with a fairy mediocre one… ha ha! Plus, I love the tomatoes. Sorry. I never make a full English at home, but my boyfriend does, which means I’m on washing up duty. It is the worst – he has to use basically every pot and utensil we have! I’d really recommend black pudding if you can get your hands on some. It’s really nicely spiced, and you fry it so it’s good and crisp on the outside.